Please, find below an overview of the most relevant papers in the International Journal of Cardiovascular Imaging over the year 2018 for the different modalities. Detter et al. evaluated in an animal experiment the value of fluorescent cardiac imaging (FCI) for intraoperative qualitative angiographic and quantitative myocardial perfusion assessment during graded coronary artery bypass grafting (CAB) stenosis compared to coronary angiography . They found that only visual assessment of CAB quality using FCI was limited as compared to coronary angiography. However, additional quantitative FCI (QFCI) identified graded CAB stenosis and occlusion with a significant correlation (r = 0.955) to transit-time flow measurement (TTFM). The team of Hayiroglu et al. investigated the prognostic value of Syntax Score II in STEMI patients complicated with cardiogenic shock and treated with primary PCI . 492 patients were included in the retrospective analysis and subdivided in three tertiles based on their Syntax Score. They found that patients in tertile 3 had a 6.2-fold hazard of in-hospital death, and therefore concluded that the Syntax II Score is a simple, feasible and clinically applicable tool for rapid risk stratification in this patient population . Left atrium (LA) size is a well-studied predictor of atrial fibrillation (AF) recurrence after pulmonary vein isolation (PVI). Strisciuglio et al. was interested in studying the value of three-dimensional rotational angiography (3DRA LA volume index) as a valid alternative to the commonly used transthoracic echocardiography (TTE LA volume index) . For that purpose they analysed 352 consecutive patients with symptomatic paroxysmal or persistent atrial fibrillation referred for PVI. From a multivariate analysis, they found that 3DRA-LAVI was the only independent predictor for AF recurrence [HR 1.01 (1.00–1.03), p = 0.017]. And therefore, concluded that left atrial volume measured with 3DRA is superior to TTE assessment and to AF history in predicting atrial fibrillation recurrence after PVI. In 3D reconstruction of coronary arterial segments from standard X-ray angiography, the definition of the coronary centerline plays an important step in the total reconstruction procedure. Kunio et al. developed and validated a vessel centerline reconstruction algorithm from non-isocentric and non-orthogonal paired monoplane angiographic images . Their method was tested in phantoms, in animal experiments as well in a small number of patients and demonstrated high accuracy and reproducibility. In this paper Karabağ et al. examined the predictive performance of Syntax II score in in-hospital and long-term mortality of STEMI patients and to compare SYNTAX score (SS) and TIMI risk score (TRS) . The predictive power of SS-II, SS, and TRS were compared by ROC curve and decision curve analysis. SS-II surpassed SS and TRS in long-term and in-hospital mortality prediction. They concluded that SS-II is a powerful tool to predict in-hospital and long-term mortality from all causes in STEMI patients treated with p-PCI. Hayıroğlu et al. investigated the femoral hematoma predictive value of angle of sheath to trochanter major in patients undergoing elective coronary procedures in a prospective analysis of 246 patients . Twenty three patients developed a hematoma and the remaining 223 patients functioned as control. The best cut-off value of the angle of sheath to trochanter major to predict femoral hematoma was 15.6° with 74% sensitivity and 70% specificity (AUC: 0.75; 95% CI 0.63–0.86; p < 0.001). These data suggests the importance of fluoroscopic guidance during femoral artery access with the predictive role of the angle of sheath to trochanter major. The aim of the study by Maccagni et al. was to evaluate the impact of the implementation of a noise reduction technology (NRT) on patient radiation dose during CTO PCI . It is well known that CTO procedures are associated with high radiation doses to patients and personnel. The population consisted of 60 patients following the standard protocol and 127 with the NRT approach. They concluded that the use of NRT in CTO PCI is associated with lower patient radiation dose and similar image quality. Tian et al. aimed to assess the prevalence of anomalous origin of coronary arteries in a Chinese population who underwent coronary angiography for coronary artery disease, and explore any patterns in the common variants and typical anomalies, especially the potentially serious ones . From a total of 110,158 patients included in the study, 0.76% (835 cases) had anomalous origin of coronary arteries. And 47.54% (397 cases) of the anomalies were shown to be potentially serious, and an RCA arising from the left sinus of Valsalva (LSV) was the most common subtype (39.28%, 328 cases). They concluded that more clinical attention should be paid to this condition due to the potential risk of serious sequelae. The purpose of the study by Her et al. was to compare the efficacy of paclitaxel-coated balloon (PCB) treatment with stent implantation for de novo coronary lesions after successful plain old balloon angioplasty (POBA) guided by fractional flow reserve (FFR) . 200 patients were included in the study and the primary endpoint was late lumen loss at 9 months. The conclusion was that PCB treatment guided by POBA–FFR showed excellent 9 months angiographic and functional results, as well as comparable 12 months clinical outcomes, compared with stent implantation for de novo coronary lesions. The aim of this meta-analysis carried out by the team of Hideo-Kajita was to examine the available data to determine if complete revascularization (using either angio- or fractional flow reserve guidance—FFR) following primary PCI in STEMI patients without cardiogenic shock impacts clinical outcomes . A total of nine studies (3317 patients) were included. They concluded on the basis of all these data that compared to culprit-only revascularization, treating multi-vessel disease in STEMI patients using FFR guidance is associated with decreased incidence of MACE, due to a decreased rate of revascularization. Finally, Sonaglioni et al. validated a new modified method for measuring the anthropometric Haller index (HI), obtained without radiological exposure . This index is used to assess chest conformation and pectus excavatum (PE). This new method was based on the use of a rigid ruler and of a 2.5 MHz ultrasound transducer for the assessment of latero-lateral and antero-posterior chest diameters, respectively. They enrolled 100 consecutive patients. They concluded that the modified HI might allow a quick description of the chest conformation without radiological exposure and a more immediate comprehension of its possible influence on the cardiac kinetics and function, as assessed by echocardiography or other imaging modalities. The year of 2018 was very exciting for the intravascular imaging field, with several new technologies being investigated in addition of important definitions on stablished modalities. The International Journal of Cardiovascular Imaging covered several of those topics involving all aspects of intravascular imaging. Highlighting the importance of intravascular imaging, especially OCT, on guiding PCI, Kuku et al. performed a meta-analysis including 2781 patients, from three RCT and three observational studies, comparing PCI guided by intravascular imaging to angiography. They found that OCT guided PCI was associated with reduction in adverse clinical events, including cardiac deaths, MACE composite cardiac deaths, myocardial infarction and repeat revascularization when compared with angiography guidance, but found no difference when comparing OCT to IVUS. We look forward to clinical trials utilizing new metrics on OCT and it`s comparison to IVUS on powered studies . On last year edition of this journal Shen et al. evaluated the safety and feasibility of XINSORB bioresorbable sirolimus-eluting scaffold and this year the same group analyzed the healing score of the scaffold in a 6 months follow-up period. Healing score was proposed as a metric to measure the vessel recovery after stent/scaffold implantation and it is believed to correlate with adverse outcomes including stent thrombosis and restenosis. On this study the authors found that the score for the XINSORB was 6.23 which is similar to what was found at the ABSORB Cohort B1 . Paramount for the stent healing process is having strut coverage without excessive neointimal hyperplasia (NIH). Using OCT and QCA Gil et al. investigated the effect of the stent platform (stainless steel and cobalt-chromium; sirolimus concentration of 1.0 and 1.2 µg/mm2) and thickness on neointimal formation by utilizing three DES stents covered with similar biodegradable polymer and elute sirolimus but different thickness, material and platform. It was found that the thickness of the struts and the drug concentration are very important on NIH formation, whereas the material did not play a significant role . On a similar topic Kobayashi et al. compared very-early strut coverage and NIH formation between a new biodegradable polymer drug eluting stent (Synergy™ and Ultimaster™) and a second-generation durable polymer everolimus-eluting stent with OCT (Xience™ and Premier™). Previous studies showed that biodegradable eluting stents were associated with delayed vessel healing and stent endothelization. On a population of 57 patients, the new biodegradable polymer eluting stent had superior NIH thickness (21.2 µm vs. 9.8 µm) and neointimal coverage (53.9% vs. 28%), showing a significant improvement from the previous generation . In an attempt to characterize differences in neoatherosclerosis between first (Cypher® and Taxus®) and second (Xience®, Promus®, Endeavor®, Resolute Integrity® and Nobori®) generation DES, Kobayashi group retrospectively evaluated 216 patients that had in-stent restenosis (ISR) and undergone repeat PCI under OCT or OFDI guidance. The authors found that compared with second-generation DES, the proliferation of neoatherosclerosis in terms of its length and arc was significantly greater and the fibrous cap was significantly thinner in first-generation DES, suggesting a more stable proliferation and stability of neoatherosclerosis on second-generation DES . Despite the rate of stent thrombosis (ST) being low at around 1.83%, it is such a catastrophic event that deserves attention. Ñato et al. investigated the OCT and IVUS findings at 1 year follow-up, of 34 patients that had late and very-late ST treatment guided by intravascular imaging. The patients were divided at baseline according to the most probable causative factor of ST, such as malapposition (17 patients) or other findings (17 patients) and then re-assed at 1 year follow-up. They found that patients that presented with malapposition are more prone to have a worse healing pattern than those who presented with other causes, thus being at higher risk for recurrent ST .
Highlighting the importance of high resolution intravascular imaging on the decision making process, Gupta and colleagues presented a case of ambiguous angiogram imaging, that could lead to different treatments. By utilizing OCT and finding a honeycomb like structure, they were able to differentiate the thrombus recanalization from spontaneous dissection, ultimately delivering proper and directed treatment, avoiding unnecessary risks for the patient . By utilizing other imaging modalities in conjunction with intravascular imaging, Kaichi et al. showed that this approach might give important insights to elucidate the pathophysiology of eruption of coronary atheroma in vivo in a case report of a patient presenting with ST elevation in inferior leads. With the help of IVUS and computer tomography they were able to conclude that the lipidic material from a plaque rupture, traveled into coronary circulation, resulting in a zero lipid core burden at the lesion site . Lee et al. investigated whether aspirin have a protective effect on patients with vasospasm-induced coronary syndrome (VACS), by utilizing OCT to define this entity. In a retrospective cohort study they followed for 48 months 154 patients who presented with VACS: using propensity score matching those patients were divided in equal groups of non-aspirin and aspirin use. Myocardial infarction (17% vs. 3%, p = 0.003) and chest pain recurrence (26% vs. 9%, p = 0.006) occurred more frequently in the non-aspirin group, showing that aspirin may have a protective effect on patients presenting with VACS . On an effort to understand the impact of vessel morphology on physiology, Pyxaras et al. combined the data of a motorized FFR pullback with an OCT pullback, thus being able to associate regions on the OCT with pressure variations on the FFR. With this approach they were able to show, on a 26 patients series, that sub-optimal FFR (defined as an FFR post-PCI < 0.94) was associated with higher mean neointimal area (respectively: 1.06 ± 0.80 vs. 0.51 ± 0.23 mm2; p = 0.018) and higher neointimal thickness of covered struts (respectively 0.11 ± 0.07 vs. 0.06 ± 0.01 mm; p = 0.021), compared to patients with optimal FFR post-PCI. The study suggest that regions with sub-optimal FFR at baseline behave poorly and might be associated with worse outcomes . Gutiérrez‑Chico published an editorial highlighting the work done by Wu et al. on the field of shear stress and vessel biomechanics. By utilizing a simple coronary angiogram the authors were able to calculate the superficial wall stress, combining several motions of the vessel (such as radial stress, bending, stretching and twisting) and with the potential to be translated to a real world, live procedure use to guide treatment . On the topic of atherectomy and plaque modification on peripheral vessels, Kuku et al. on behalf of the CELLO study investigators, showed that excimer laser is a promising approach in preventing limb amputation over 1-year follow-up. One of the main factors believed to cause restenosis is vessel wall injury during the baseline procedure. The authors described adventitial layer disruption in < 1% of the 1867 post ablation frames assessed by IVUS, which resulted in a secondary patency of 100% at 6 and 12 months, despite a lower percentage of primary patency. Those are very promising results and results from RCT are welcomed . Oba and his groups described a case in which they performed an angioplasty using paclitaxel-coated balloon (SeQuent® Please; B. Braun, Melsungen, Germany) to treat an ISR due to a stent fracture observed by OFDI. They preferred this approach in order to avoid an possible increased inflammatory response by the stent fracture plus the new struts. They reported that 8 months later OFDI showed the total separation of the struts due stent fracture, coronary angiography revealed a satisfactory status of the lesion and the fibrous cap thickness was increased . Rotational atherectomy (RA) for calcified coronary lesions is currently a hot topic and The International Journal of Cardiovascular Imaging covered two different publications on the theme. Kim et al. investigated using IVUS the effects of rotational atherectomy (Rotablator™ Rotational Atherectomy System) in calcified coronary lesions on a series of 38 patients. By utilizing this device with the rotational speed raging between 160,000 and 200,000 rpm they showed that minimum lumen area, maximum reverberation number, angle, and length increased post atherectomy, which indicates calcium modification. In addition newly visible perivascular tissue through previously solid calcium (indicating calcium fracture) was observed . Still on rotational atherectomy, but this time utilizing OFDI and Rotalink Plus™ Rotational Atherectomy System (Boston Scientific Corporation, Natic, MA, USA) to investigate findings that predict good stent expansion post debulking, Kobayashi et al. performed a prospective, single center study, in which included 44 patients or 50 de novo severely calcified coronary lesions. His group found that the minimum thickness of calcium in the intima after RA was the most important calcium parameter associated with stent expansion. Second, stent expansion was significantly better in the lesions with dissection after RA, compared to lesions without dissection. Third, the minimum thickness of calcium in the intima and dissection formation after RA were independent predictors of good stent expansion . In a review paper, Shrestha et al. highlighted the enormous importance that OCT have in assessing vulnerble plaque in coronary bifurcation lesions. Due to its spatial resolution of 10 µm and faster pullback speed reducing artifacts formation, OCT can identify fibrous, fibrocalcific, lipid-rich coronary plaque and also measure the thickness of the fibrous cap, it directly visualizes micro-vessels within the coronary atherosclerotic plaque. With that information and its ability to provide lumen dimensions, vulnerable plaque’s composition and characteristics, the author believes its clinical significance and several other essential findings associated with bifurcation lesions will guide bifurcation lesion intervention to a better outcome . Chen et al. investigated whether IVUS guided treatment is better than angiography alone in treating unstable angina patients and Medina 1,1,1 or 0,1,1 coronary bifurcation lesions. Over a 6-year period they included 310 patients in the IVUS guidance and utilized propensity matching score to pair with 620 patients in the angiography group. They found that MACE occurred in 10.0% of patients at 1-year follow-up and 15.2% at the 7-year follow-up in the IVUS group, significantly different from 15.0% (p = 0.036) and 22.4% (p = 0.01) in the angiography group, respectively. Compared to angiography guidance, IVUS guidance also resulted in a lower 7-year cardiac death rate (6.5 vs. 1.3%, p = 0.002) and MI (8.4 vs. 2.3%, p < 0.001), suggesting that intravascular imaging is crucial in obtaining good results when treating bifurcation lesions . In 2018 different excellent paper in the field of nuclear cardiology were published in the journal. In this review we selected a few papers on the topics of new technological developments, myocardial flow reserve assessment and myocardial viability. There is ongoing debate in the context of myocardial perfusion imaging (MPI) with CMR on the merits of using technically complex acquisition methods to achieve whole-heart spatial coverage, rather than conventional three-slice acquisition. As an adequately powered comparative study is difficult to achieve for two separate CMR Studies, Shariff et al. compared whole-heart versus simulated three-slice coverage in a large existing SPECT data set from 651 patients with suspected CAD who underwent invasive angiography. Diagnostic accuracy for the three-slice and whole-heart approaches were similar (AUC 0.743 vs. 0.855 respectively, p = 0.07). However, the majority (54%) of cases missed by three-slice imaging had primarily apical ischemia. Therefore, the authors conclude that caution is required when comparing the ischemic burden between three-slice and whole-heart datasets and that there is a need to establish prognostic thresholds specific to each approach. It is unclear whether myocardial flow reserve (MFR) derived by dynamic perfusion SPECT using a novel D-SPECT camera reflects the severity of coronary atherosclerosis. Iguchi et al. studied 40 patients who underwent both a myocardial dynamic perfusion SPECT study and invasive coronary angiography. All patients underwent a rest/stress SPECT imaging protocol using Tc-99m-sestamibi and dynamic acquisition was performed. Stress and rest flow was evaluated and global and regional MFR was calculated. The severity of coronary atherosclerosis was evaluated using the Gensini score. The main findings were that global MFR derived by dynamic perfusion SPECT using D-SPECT reflects the severity of coronary atherosclerosis. Also, regional MFR was significantly lower in regions with > 90% stenotic lesions compared with regions with < 90% stenotic lesions. Based on these results, global and regional MFR derived by dynamic perfusion SPECT may reflect the global and regional severity of coronary atherosclerosis. The total number of patients was however limited and no invasive fractional flow reserve measurements were performed, so clearly further studies are needed on this topic. Combined MFR by PET and CT coronary angiography (CTA) is a promising toot for assessment of CAD. Prior studies of MFR/CTA has been performed as side-by-side interpretation, not as volume rendered, full hybrid analysis, with fused MFR/CTA. Braad et al. developed a method for full hybrid analysis of MFR/CTA and determined the diagnostic value of side-by-side versus full hybrid MFR/CTA with 15-O-water PET. They studied 44 patients who underwent stress/rest 15-O-water PET/CTA with invasive coronary angiography as reference. MFR showed a high reproducibility within and between observers of different expirience. The full hybrid model was not superior to side-by-side interpretation of MFR/CTA but proved better than MFR alone at vessel level with regard to specificity, positive predictive value, and accuracy, suggesting that this full hybrid analysis of MFR/CTA may become a clinical relevant tool for the assessment of CAD. Non-invasive imaging plays a growing role in the diagnosis and management of ischemic heart disease from its earliest manifestations of endothelial dysfunction to myocardial infarction along the myocardial ischemic cascade. 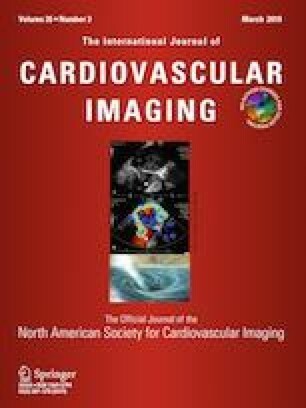 Experts representing the North American Society for Cardiovascular Imaging and the European Society of Cardiac Radiology have provided an extensive review of the current status of non-invasive imaging for ischemic heart disease, along with the role of imaging for guiding surgical planning of patients who may require coronary artery bypass grafting. Special attention is given to the cost-effectiveness of the different imaging modalities in this excellent state-of-the art overview . Positron emission tomography/computed tomography (PET/CT) imaging with (18) F-radiolabeled fluorodeoxyglucose (FDG) is a powerful imaging technique for the assessment of myocardial viability in patient with CAD. Data on the role of cardiac viability imaging in elderly patients are however scarce. Namdar et al. evaluated 89 patients > 65 years (mean age 74 years) with CAD and LVEF < 40% with cardiac FDG PET/CT. Patients were stratified according to the presence/absence of viable myocardium and subsequent revascularization and followed for changes in LVEF and hard cardiovascular end-points. An increase in LVEF was only noted in patients with viable myocardium who underwent revascularization (n = 37, increase of LVEF of 3.8% after 2 ± 1 years). Importantly viable myocardium was associated with better clinical outcomes in these elderly patients when revascularized. These findings are in line with many previous studies in similar younger patients and support the assessment of viability with FDG PET/CT in elderly patients with CAD and reduced LVEF. Wang et al. evaluated the prognostic value of LV viability and remodeling parameters in 126 patients with LV aneurysms. Patients underwent gated PET, gated SPECT and CMR and were followed for 3.9 years. Patients were divided into three groups by aneurysmal viability (mismatch score of aneurysm ≥ 2) and LV remodeling (ESVI > 60 ml/m2 by gated PET): group 1 (viability –, LV remodeling –), group 2 (viability –, LV remodeling +) and group 3 (viability +, LV remodeling ±). LV remodeling was associated with cardiac death during follow-up and only for patients in group 3 coronary revascularization was associated with better long-term survival. These data suggest that when using LV viability as a parameter for decision making regarding revascularization, also LV remodeling should be taken into account in CAD patients with LV aneurysm. In 2018 several interesting echocardiography studies appeared in the International Journal of Cardiovascular Imaging. Some of them are highlighted here. Pulmonary hypertension is a disease with severe morbidity and mortality. Echocardiography plays an essential role in the screening of pulmonary hypertension. The quality of the acquired continuous wave Doppler signal is the major limitation of the method and can greatly affect the accuracy of estimated pulmonary pressures. The aim of the study by Schneider et al. was to evaluate the clinical need to image from multiple ultrasound windows in patients with suspected pulmonary hypertension . They prospectively evaluated 65 patients (43% male, mean age 67.2 years) with echocardiography and right heart catheterization; 17% had invasively normal pulmonary pressures, 83% had pulmonary hypertension. Peak tricuspid regurgitation velocity was imaged in five echocardiographic views. Sufficient Doppler signal was recorded in 94% of the patients. Correlation for overall peak tricuspid regurgitation velocity with invasively measured systolic pulmonary artery pressure was r = 0.83 (p < 0.001). Considering all five imaging windows resulted in a sensitivity of 87%, and a specificity of 91% for correct diagnosis of pulmonary hypertension with an AUC of 0.89, which was significantly better as compared to sole imaging from the right ventricular modified apical four-chamber view (AUC 0.85, p = 0.0395). Additional imaging from atypical views changed the overall peak tricuspid regurgitation velocity in 32% of the patients. A multiple-view approach changed the echocardiographic diagnosis of pulmonary hypertension in 11% of the patients as opposed to sole imaging from an apical four-chamber view. Does pocket-size ultrasound imaging improve the accuracy of the initial assessment of suspected pulmonary embolism? Pulmonary embolism onset is frequently neglected due to the non-specific character of its symptoms. Pocket-size imaging devices present an opportunity to implement imaging diagnostics into conventional physical examination. The aim of the study by Filipiak-Strzecka et al. was to test the hypothesis that supplementation of the initial bedside assessment of patients with suspected pulmonary embolism with four-point compression venous ultrasonography and right ventricular size assessment with the use of pocket-size ultrasound imaging equipped with dual probe could positively influence the accuracy of clinical predictions. A single-centre, prospective analysis was conducted on 100 patients (47 men, mean age 68 ± 13 years) with suspected pulmonary embolism. Clinical assessment on the basis of Wells and revised Geneva score and physical examination were supplemented with four-point compression venous ultrasonography and right ventricular size assessment with the use of pocket-size ultrasound imaging. The mean time of pocket size scanning was 4.9 ± 0.8 min and was universally accepted by the patients. Fifteen patients had deep venous thrombosis and right ventricular enlargement was observed in 59 patients. Pulmonary embolism was confirmed in 24 patients. If both the venous ultrasonography was positive and right ventricle enlarged, the specificity was 100% and sensitivity 54%, ROC AUC 0.771 (95% CI 0.68–0.85). The Wells rule within the study population had a specificity of 86% and sensitivity of 67%, ROC AUC 0.776 (95% CI 0.681–0.853, p < 0.0001). Similar values calculated for the revised Geneva score were as follows: specificity 58% and sensitivity 63%, ROC AUC 0.664 (95% CI 0.563–0.756, p = 0.0104). Supplementing the revised Geneva score with additional criteria of venous ultrasonography result and right ventricular measurement resulted in significant improvement of diagnostic accuracy. The difference between ROC AUCs was 0.199 (95% Cl 0.0893–0.308, p = 0.0004). Similar modification of Wells score increased ROC AUC by 0.133 (95% CI 0.0443–0.223, p = 0.0034). Despite the well-acknowledged role of the pulmonary embolism clinical risk assessment scores the diagnostic process may benefit from the addition of basic bedside ultrasonographic techniques. Does transducer frequency setting affect speckle tracking measures? Speckle tracking echocardiography is an emerging technique, which is currently being included in clinical guidelines. Olsen et al. sought to investigate the impact of transducer frequency settings on speckle tracking derived measures . The study comprised of 22 subjects prospectively enrolled for a randomized controlled trial (LOOP-study). Patients were above 70 years of age with increased risk of stroke, and had an echocardiogram performed, which included focused images of the left ventricle. Focused images were obtained with the transducer frequency set at both 1.7/3.3 and 1.5/3.0 MHz. The images were obtained immediately after each other at the exact same position for the two settings. Speckle tracking was performed in three apical projections, allowing for acquisition of layered global longitudinal strain and strain rate measures. Concordance between the frequency settings was tested for endo-, mid-, and epicardial global longitudinal and strain rates by coefficients of variation, bias coefficients and visually displayed by Bland–Altman plots. Bland–Altman plots did not reveal any significant over- or underestimation of any speckle tracking measure. Bias coefficients showed that none of the measurements differed significantly between the two settings. Changing between transducer frequency settings does not systematically derange speckle tracking measures. The authors concluded that one can safely reduce the transducer frequency without compromising the validity of speckle tracking derived measures. Right ventricular strain values by two-dimensional strain echocardiography can be used as objective markers of right ventricular systolic function. However, there is little data about normal reference right ventricular strain values according to age and gender. Park et al. analysed right ventricular strain data from the digitally stored echocardiographic images from NORMAL (Normal echOcardiogRaphic diMensions and functions in KoreAn popuLation) study for the measurement of normal echocardiographic values performed in 23 Korean university hospitals . They enrolled in total 1003 healthy persons in the NORMAL study. Of them, they analysed two-dimensional right ventricular strain values in 493 subjects (261 females, mean 47 ± 15 years old) only with echocardiographic images by GE machines. Their LV systolic and diastolic functions were normal. Total right ventricular global longitudinal peak systolic strain was − 21.5 ± 3.2%. Females had higher absolute values than males. Younger (< 50 years old) females had higher absolute values than age matched males. Total right ventricular global longitudinal peak systolic strain in females gradually increased according to age (p for trend = 0.002) and becomes almost similar in age ≥ 50 years. However, this trend was not seen in males (p for trend = 0.287), and younger males had similar values to that of older men. Is right atrial strain associated with right atrial pressure? Echocardiographic assessment of right atrial pressure from inferior vena cava dimension may underestimate catheter-derived right atrial pressure. As right atrial deformation, measured by speckle tracking, is preload-dependent, Wright et al. hypothesized that right atrial strain may improve estimation of catheter derived right atrial pressure . Right atrial strain components were measured in 125 of 175 patients who had echocardiography and invasive measures of right atrial pressure. (median difference 1 day). To determine whether right atrial strain measures differentiated patients with correct vs. incorrect right atrial pressure from inferior vena cava assessment, categories with values < 3, 8 and > 15 mmHg were compared with groups < 3, 4–7, 8–10, 11–14 and > 15 mmHg. Non-invasively determined right atrial pressure was significantly lower (p = 0.001) than invasively determined right atrial pressure, with a weak correlation (r = 0.35, p < 0.001). Right atrial strain components were associated with right atrial size, right ventricular function and inferior vena cava size. In those with inferior vena cava derived right atrial pressure > 15 mmHg, half of patients were categorized into right atrial pressure < 10 mmHg. There were no significant differences in right atrial characteristics that differentiated patients in whom echocardiographic estimation of right atrial pressure was inaccurate. Right atrial strain measures were feasible, and had associations with right atrial size, right ventricular systolic function and inferior vena cava size. Right atrial strain was significantly different between those with normal vs. raised pressure, but it did not identify those with incorrect echocardiographic assessment of right atrial pressure. Can left atrial deformation parameters predict for paroxysmal atrial fibrillation in patients with end-stage renal disease? It is widely known that various factors contribute to left atrial mechanical dysfunction in patients with end stage renal disease. However, the connection between atrial dysfunction and arrhythmic events such as paroxysmal atrial fibrillation, in this group of patients, remains unclear. Papadopoulos et al. prospectively evaluated the association between left atrial deformation indices and paroxysmal atrial fibrillation in 79 patients with end stage renal disease and preserved left ventricular systolic function . All patients underwent a baseline comprehensive echocardiography study and were followed for a mean period of 16 ± 5 months. Paroxysmal atrial fibrillation episodes, first and the following events, were reported. Left atrial longitudinal strain reflecting left atrial reservoir function and left atrial longitudinal strain rate reflecting left atrial pump function were specifically evaluated as left atrial deformation indices of interest, using 2D speckle tracking echocardiography. At the end of follow up period nine patients died. Fifteen of the rest 70 reported one or more episodes of paroxysmal atrial fibrillation. Left atrial indexed volumes were significantly higher in patients with paroxysmal atrial fibrillation (32 ± 26 vs. 21.5 ± 9 ml/m2, p = 0.002), mean left atrial strain was significantly reduced (17 ± 7 vs. 27 ± 9%, p < 0.001) as well as mean left atrial strain rate (− 1.19 ± 0.5 vs. − 1.95 ± 0.5 1/s, p < 0.001). Multivariate analysis showed that left atrial strain rate when adjusted with age together with paroxysmal atrial fibrillation history remained the single most significant echocardiographic parameter for paroxysmal atrial fibrillation prediction. Further prospective studies are needed to validate its relevance in routine clinical practice. Tadic et al. evaluated right ventricular structure, function and mechanics in cancer patients before initiation of chemo- or radiotherapy, and the association between cancer and decreased right ventricular longitudinal strain . This retrospective investigation included 101 chemo- and radiotherapy-naïve patients with solid cancer and 38 age- and gender-matched controls with similar cardiovascular risk profile. Echocardiographic examination and strain evaluation was performed in all participants. Right ventricular structure and right ventricular systolic and diastolic function estimated with conventional echocardiographic parameters were similar between the cancer patients and controls. However, right ventricular global longitudinal strain was significantly decreased in the cancer patients than in controls. The same was revealed for right ventricular free wall endocardial and mid-myocardial longitudinal right ventricular strains, whereas difference was not found in right ventricular free wall epicardial longitudinal strain. The presence of cancer was independently of age, gender, body mass index, left ventricular hypertrophy, diabetes, hypertension and pulmonary pressure associated with reduced right ventricular global longitudinal strain, as well as with decreased free wall right ventricular longitudinal strain. Right ventricular strain is deteriorated in the chemo- and radiotherapy-naïve cancer patients. Finally we would like to recommend a review on patent foramen ovale and stroke . Patent foramen ovale (PFO) is a residual, oblique, slit or tunnel like communication in the atrial septum that persists into adulthood. It is usually an incidental finding with no clinical repercussions. Nevertheless, recent evidence supports the association between the presence of a patent foramen ovale and a number of clinical conditions, most notably cryptogenic stroke. There is enough evidence that paradoxical embolism is a mechanism which can explain this association. Patient characteristics and certain echocardiography-derived anatomical and hemodynamic features of patent foramen ovale provide great assistance in estimating the probability of paradoxical embolism. In this review, the authors describe patent foramen ovale embryology and anatomy. They extensively present the available data on clinical, anatomical and hemodynamic features of PFOs which have been correlated with increased likelihood of paradoxical embolism and recent evidence of therapeutic management. There were a number of important contributions in cardiovascular MRI (CMR) in 2018. Many of these were related to the use of T1 and T2 mapping methods. Piechnik and Jerosch-Herold reviewed physical and physiological mechanisms which underlie the interpretation of T1 measurements and extracellular volume fraction (ECV) . The variability of native myocardial T1 values was assessed by Lin et al. . An automated regional analysis of myocardial native T1 of the left ventricle was presented . Lagan et al. reviewed the application of multi-parametric CMR in myocarditis and systemic inflammatory diseases . While normal left ventricular function was found in patients who have undergone orthotopic heart transplantation, these patients have higher ECV and intracellular lifetime of water (a measure of cardiomyocyte hypertrophy compared with age-matched volunteers ). In related work, Yuan et al. found increased ECV and T2 values in asymptomatic heart transplant patients . The inversion time used for late gadolinium enhancement was found to be non-inferior to ECV for distinguishing cardiac amyloidosis from hypertrophic cardiomyopathy . T1 mapping and rest-stress T1 mapping of the spleen demonstrated that the splenic switch-off sign is not a reliable indicator of stress adequacy during adenosine perfusion CMR . A T1-mapping based synthetic inversion recovery approach determine the optimal inversion time for LGE was presented . Right ventricular T1 mapping and ventricular dysfunction were found to be correlated by Jellis et al. . Podlesnikar et al. reviewed the potential for CMR to assess myocardial fibrosis in valvular heart disease . There also were important contributions in myocardial strain assessment with CMR. A strong association was found for 3D myocardial strain and T1 mapping in patients with cardiac amyloidosis . Other workers found decreased global longitudinal strain and strain rate in the epicardial and endocardial layers in patients with cardiac amyloidosis secondary to multiple myeloma . Left ventricular circumferential strain was assessed by CMR tagging, CMR feature tracking and speckle tracking echocardiography in patients being evaluated for cardiac resynchronization therapy showing better agreement for both CMR methods compared with echocardiography . Both myocardial perfusion reserve and global longitudinal strain were found to be abnormal in patients with orthotopic heart transplantation but not related to allograft rejection, myocardial scar/fibrosis or allograft dysfunction . Reference ranges for 3D feature tracking were provided . Strain values assessed with CMR feature tracking were found to have an association with age and gender but not other cardiovascular risk factors in asymptomatic Asian subjects . A fully-automated method for left ventricular mass and volume analysis was applied to the UK Biobank population and found to have good agreement to manual analysis . The peak filling and emptying rates of both ventricles were found to be highly reproducible in patients with pulmonary arterial hypertension . Chronic aortic regurgitation patients taking metroprolol were found to have significantly lower mean heart rate, cardiac power index and rate-pressure product compared with those taking losartan however the aortic regurgitation fraction was greater . Passive left atrial ejection fraction was found to be the most sensitive of various functional indices for function and structure in a CMR assessment patients with type 2 diabetes mellitus compared with healthy controls . The role of CMR for imaging ischemic heart disease was reviewed [64, 65]. Incomplete coverage of the left ventricle using three short axis slices was not found adversely affect diagnostic accuracy compared with a whole heart assessment but may fail to detect apical ischemia and underestimate the extent and severity of perfusion defects . Whole heart CMR perfusion was fused with coronary CTA permitting correlation with culprit coronary lesions . The utility of CMR in patients with hypertrophic cardiomyopathy (HCM) was demonstrated in several publications. Multiparametric CMR was used to distinguish HCM from other causes of left ventricular hypertrophy . Maragiannis et al. found significantly longer T1 relaxation time in patients with HCM compared with controls which was associated with left ventricular diastolic dysfunction . Gommans et al. found high T2-weighted signal intensity was associated with higher risk of sudden death in patients with HCM . Left atrial indexed volume and LGE were found to be predictors of poor clinical outcomes in patients with end-stage HCM . Diffusion-weighted CMR was found to be comparable to PET-CT in the follow-up of patients with chronic periaortitis . The use of a blood pool contrast agent for gated thoracic MRA at 3 T was found to improve the image quality compared with a non-contrast technique and provided more reproducible measurements of the aortic annulus area . There were several publications highlighting the use phase contrast in the aorta. Kamphuis et al. found good scan-rescan reproducibility of diastolic left ventricular kinetic energy, viscous energy loss, and vorticity assessment . Ferumoxytol was found to be a good alternative to gadofosveset trisodium for 4D flow image quality . Pulse wave velocity calculated from 4D flow of the aorta at 3T and was found to significantly correlated to measures of arterial stiffness determined with transesophageal echocardiography in stroke patients . Forward displacement in the ascending aorta was suggested as a surrogate marker for wall shear stress in patients with aortic regurgitation . The aortic stiffness of ascending aorta was found to be increased in children having coarctation of the aorta repaired surgically or balloon angioplasty whereas no difference was observed with those treated with a stent compared with controls . In other work related to congenital heart disease, the effects of breath holding for quantification of left-to-right shunt in patients with secundum atrial defect were and found to be best with expiratory breath hold as compared with either free breathing or inspiratory breath hold using invasive oximetry as the reference standard . Diffuse fibrosis was found to be common in the left ventricle but not right ventricle in patients with transposition of the great arteries late after atrial switch repair . The Grothoff approach to assess left ventricular non-compaction was found to better capture the extent of non-compacted tissue compare with the Jacquier approach . The use of CMR for atrial tissue characterization in arrhythmias and guidance for electrophysiology procedure guidance was reviewed . Time-resolved contrast-enhanced MRA was found to have superior image quality compared to traditional contrast-enhanced MRA in patients with atrial fibrillation being evaluated for ablation procedures . The feasibility of CMR guidance for endomyocardial biopsy was demonstrated in an in vivo porcine model . The same group also demonstrated the feasibility of MRI guided renal denervation using active tracking in a porcine model . Coronary CTA is well established, but remains limited in the assessment of clinical significance of intermediate and calcified lesions. Non-invasive assessment of lesion significance with rest/stress myocardial perfusion imaging and fractional flow reserve (FFRCT) derived from coronary computed tomography angiography therefore are relevant topics. Ghekiere et al. examined 37 patients with intermediate stenoses (n = 39) identified with coronary CTA . The correlations between FFRCT and adenosine perfusion cardiac magnetic resonance (CMR) with invasive FFR were retrospectively evaluated. Invasive FFR values correlated equally strongly with FFRCT (r = 0.675; p < 0.001) and the relative CMR myocardial perfusion index (r = − 0.63) (p < 0.001; z = 6.72) for assessment of lesion-specific ischemia. In an ex vivo model, van Assen et al. evaluated the effect of temporal sampling rate in dynamic CT myocardial perfusion imaging (CTMPI) on myocardial blood flow (MBF) in three porcine hearts using different acquisition modes . True MBF was calculated using input flow and heart weight. Significant differences in MBF between shuttle, non-shuttle and continuous mode were found. The median MBF in the shuttle mode was 56% lower than the true MBF. In non-shuttle and continuous mode, the underestimation was 41% and 18%. The authors conclude, that limited temporal sampling rate in standard dynamic CTMPI techniques contributes to substantial underestimation of true MBF. Nozue et al. examined the predictors that results in cases being inappropriate for FFRCT processing . From a group of 50 patients, FFRCT could not be derived in11 (22%). Heart rate at CCTA examination (72 beats/min vs. 63 beats/min; p = 0.007) and Agatston score (665 vs. 33; p = 0.002) were significantly higher in these patients. Multivariate logistic regression analyses revealed that heart rate at CCTA examination [OR 1.348 (95% CI 1.167–1.556); p < 0.001] and Agatston score [OR 1.002 (95% CI 1.000–1.003]; p = 0.004) were significant, independent factors associated with non-measurability of FFRCT. The frequency of poor image quality was highest in patients with heart rate > 65 beats/min and Agatston score > 400 (p < 0.0001). Interestingly, two papers from van der Werf et al. about coronary calcium scoring discussed that there is still a need to standardize acquisition in particular when comparing results across vendor platforms [88, 89]. The studies examined the influence of heart rate on coronary calcium scores (CCS) using a dynamic phantom as the influence of iterative reconstruction on coronary calcium scores (CCS) at different heart rates for four state-of-the-art CT systems from different manufacturers. Beyond TAVR, image guidance is important for an increasing number of structural and valvular heart disease interventions. Lindner et al. examined CT imaging in the context of left atrial appendage closure (LAAC) . The authors applied a standardized imaging protocol to detect and quantify peri-device leaks (PDL) after LAAC. CTA datasets of 49 consecutive patients 6 months after successful LAAC were acquired on a third generation dual-source computed tomography system. Overall PDL rate was 31%. Leak rates among different left atrial appendage morphologies varied largely. Windsock type had the highest incidence of PDL (47%). AMPLATZER™ AMULET™ device type revealed slightly higher PDL rates than WATCHMAN™ type and showed larger leaks. However, no statistical differences were found. Obasare et al. examined the role of three-dimensional (3D) printing of the LAA in 14 patients who underwent Watchman device (WD) implantation . The patients underwent cardiac computed tomography (CCT) with 3D printing to produce a latex model of the LAA for pre-procedure planning. The model correlated perfectly with implanted device size (R2 = 1; p < 0.001), while TEE-predicted size showed inferior correlation (R2 = 0.34; 95% CI 0.23–0.98, p = 0.03). Use of the model was associated with reduced procedure time (70 ± 20 vs. 107 ± 53 min, p = 0.03), anesthesia time (134 ± 31 vs. 182 ± 61 min, p = 0.03), and fluoroscopy time (11 ± 4 vs. 20 ± 13 min, p = 0.02). Absence of peri-device leak was also more likely when the model was used (92 vs. 56%, p = 0.04). 3D and 4D CT imaging is also applied to the assessment of patient with endocarditis (IE). Sims et al. compared cardiac CTA and TEE in the detection of endocarditic lesions . 255 adults who underwent surgery for IE at the Mayo Clinic Rochester between January 1, 2006 and June 1, 2014 were identified retrospectively. 251 patients underwent TEE and 34 patients underwent cardiac CTA. TEE had statistically higher detection of vegetations (95.6 vs. 70.0%, p < 0.0001) and leaflet perforations (81.3 vs. 42.9%, p = 0.02) as compared to cardiac CTA. For detection of abscess/pseudoaneurysm TEE had a similar sensitivity to cardiac CTA (90.5 vs. 78.4%, p = 0.21). Goo et al. examined coronary artery anomalies on preoperative cardiac CT 318 children with tetralogy of Fallot or Fallot type of double outlet right ventricle were reviewed and compared with surgical findings . Incidences of total and surgically critical coronary artery anomalies, concordance rate between cardiac CT and surgical findings, and diagnostic accuracy of cardiac CT were assessed. In addition, the types of surgical modifications for surgically critical coronary artery anomalies were reviewed. The incidences of total and surgically critical coronary artery anomalies were 8.5% (27/318) and 5.0% (16/318), respectively. The concordance rate between cardiac CT and surgical findings was 95.0% (302/318). The diagnostic accuracy of cardiac CT was 96.9% (308/318). Xiang et al. examined 70 patients with total anomalous pulmonary venous connection (TAPVC) between May 2014 and June 2017 in Hunan Children’s Hospital . Clinical data and computed tomography imaging were reviewed, and survival time was recorded. Pulmonary venous obstruction (PVO) was found in 30 (42.9%) of 70 patients in this group. Of all concurrent abnormalities, atrial septal defect (ASD) was the most common (98.6%), followed by patent ductus arteriosus (PDA; 31, 44.3%), and persistent left superior vena cava (PLSVC; 5, 7.1%). 1, 3, 6 and 12-month survival rates were 76, 61, 49, and 38% respectively. Risk factors for mortality in multivariable analysis comprised PVO, McGoon index (MGI), and mode of delivery. Advances in software, including machine learning and artificial intelligence applications are an exciting aspect of imaging. Gao et al. assess the quality of a new tool for the semi-automatic quantification of thoracic aortic dimensions in 29 patient with two CTA scans for which the official clinical report indicated an increase in aortic diameters . Aortic maximal cross-sectional diameters of baseline and follow-up studies generated semi-automatically by the software were compared with corresponding manual measurements. The semi-automatic measurements were performed at seven landmarks defined on the baseline scan by two operators. The semi-automatic software generated results in 27 patients (93.1%), demonstrating excellent intraclass correlation coefficients (all values ≥ 0.91) and small differences. The semi-automatic tool decreased the processing time by 40% (13 vs. 22 min). Pourmorteza et al. examined stretch quantification of endocardial engraved zones (SQUEEZ) as a measure of regional cardiac function in an animal model . The authors determine the effect of lowering the radiation dose on the precision of automatic SQUEEZ assessments of RWMA. Chronic myocardial infarction was induced in ten swine and CT was performed 5–11 months post infarct using first-pass contrast enhanced segmented cardiac function scans on a 320-detector row scanner at 80 kVp/500 mA. Images were reconstructed at end diastole and end systole with both filtered back projection and using the “standard” adaptive iterative dose reduction (AIDR) algorithm. For each acquisition, nine lower dose acquisitions were created. Regional wall motion abnormality could be quantified with good precision from low dose acquisitions, using SQUEEZ, as long as the blood-myocardium CNR stayed above 4. Abd Alamir et al. evaluated the effectiveness of using computer aided diagnosis in the triage of low to intermediate risk emergency chest pain patients with Coronary Computed Tomographic Angiography (CCTA) . The authors compared the diagnostic capability of computer aided diagnosis to human readers in 923 ED patients with chest pain and examined index and 30 days outcomes by diagnosis for computer analysis and the human reader. 60% of cases could be triaged by the computer. Sensitivity was approximately 85% for 64 and 320 slice scanners, with specificity at 50.6% for the 64 slice and at 56.5% for the 320 slice scanner (per person measures). The NPV was 97.8 and 97.1 for the 64 and 320 slice scanners, respectively. The ROC for Computer Aided Diagnosis for the 64 and 320 Slice Scanners, using the human reader as the gold standard was 0.6794 and 0.7097 respectively. The index and 30 day outcomes were consistent for the human reader and computer aided diagnosis interpretation.